Announcement Welcome to The Cosy Canine Company. 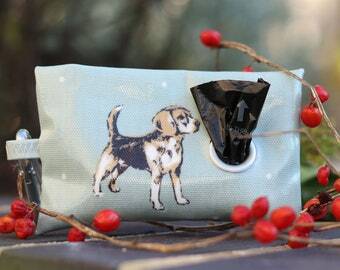 The home of beautiful bespoke goods for you and your dogs. All of my items are handmade by me and include shopping bags, dog walking bags, apron and dog crate covers. Most of my items are ready to ship and will posted the next working day. My current processing time for made to order and personalised item is 3 to 4 weeks. Most orders are ready much sooner but sometimes life happens! If you need something by a particular date, please send me a message I am really happy to help. Enjoy your visit to my shop and if you have any questions please send me a message. Welcome to The Cosy Canine Company. Really great apron to use while showering my dogs. I had a towelling one from another company which isn’t as good as this one. What I love about this apron is that it keeps me dry and I can also tie it secure around me. My towelling one wasn’t as secure so sometimes my dog’s paws got caught up in it. Thank you Cosy Canine Company - love the design too! Beautiful personalised bag, thank you so much Lottie. Adding the final touches to a personalised dog walking bag. The “please stop working and play” look! But dog poop bag holders don’t make themselves!! 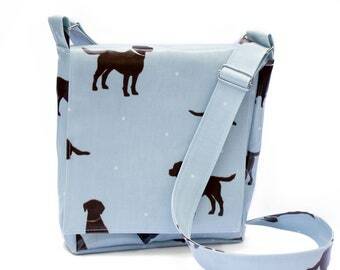 These Dog Walking Bags have been shipped today. Two are staying in the U.K. and two are off to the USA! I wonder what exciting walks they will be going on. My stand at PupAid 2018. I'm at my happiest when sitting at my sewing machine making up customer orders. My gorgeous family. I still can't believe that my son is now taller than me! This is where I make everything. With the Pickle watching over! Pickle and Baxter enjoying a bluebell walk in the spring. You love your dogs and love to look great. I make beautiful and fun accessories for you and your dog, from dog crate covers to poop bag holders. Everything is handmade by me, Lottie, so you know that you will be getting a unique item that has been created with close attention to detail and quality. 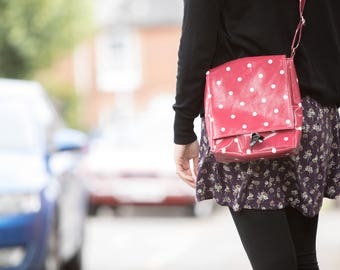 My items are all made from high quality oilcloth in fabulous dog prints or polka dots so along with looking great you know that your bag, apron or dog crate cover will be durable and easy to keep clean. The dog walking bags and poop bag holders all have a poop bag dispenser and are supplied with a roll of bags, so you will never be caught without when the need arises! Making things has always been a love of mine and it was the arrival of my dog Baxter that inspired me to make dog crate covers. I wanted his crate to be a safe and cosy bedroom, but, I also wanted it to look good and to be practical. From there I went on to design my poop bag holders, dog walking bags and aprons. I have been featured in several blogs and have received over 70 five-star reviews in my Etsy shop, so you can be assured that you are buying something that is unique and of high quality. Charlotte Clements 32 Longship Way, Maldon, Essex CM9 6UJ U.K.
How long will my Crate Cover take to arrive? Crate covers are usually ready to be shipped within a week but allow 3 - 4 weeks. Via International Tracked and Signed delivery. This service is tracked. Estimate delivery times are 5-7 days. Via Recorded First Class delivery. Please note that all delivery times are estimated not guaranteed. All orders are wrapped in tissue paper and tied with ribbon. Crate covers, bags and aprons are shipped in a tough poly mailer bag. Poop bag holders are shipped in a jiffy envelope. Most items are ready to ship the next business day. U.K. orders are sent using Royal Mail 2nd Class post. Upgrades to 1st Class and 1st Class Recorded are available. International orders are all sent using Royal Mail’s International Tracked and Signed service. This service usual takes between 5 and 10 days. Made to order items have a processing time of 3 - 4 weeks and are sent using the above shipping services.